We were losing chickens. By August, we had lost all of our spring roosters and we assume they died protecting their (our laying) hens. When the roosters were gone we started losing hens, almost daily. The day Sophie lost her prized Bantam hen “Peppermint” evidenced by a puff of tiny buff and white feathers, we decided that we must act and fast. 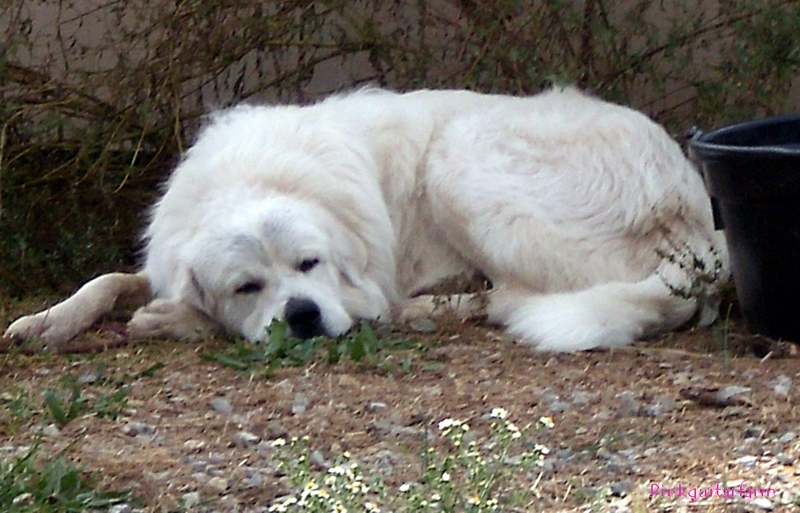 We felt we had two choices, fence the chickens in, or find LGD’s (Livestock Guard Dog’s) to protect them. We love having our chickens range and initially suffered few losses. But our farm was becoming an all you can eat buffet for all the usual (and possibly some unusual) suspects. 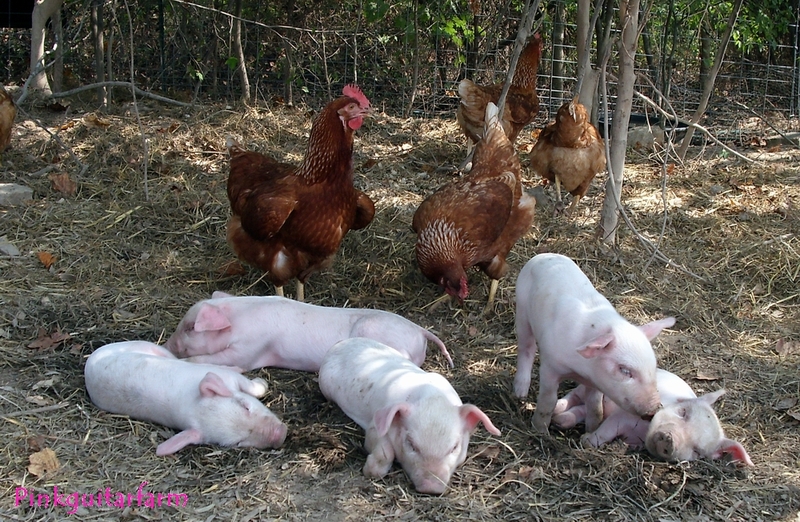 We want our chickens to eat bugs, weeds and whatever else a chicken/raptor chooses to eat even if it means hanging out with piglets. We feel that especially in the summer time, it cuts down on feed costs and aids health and immunity (as long as they are not being eaten by a predator!). We also like the idea that our chickens get to go for an afternoon stroll (or scratch, rather) in the woods, take a dust bath in the pony pasture or simply work out their chicken politics in an open forum. We decided we did not want to fence them in, nor did we have the means to tractor them, so free range it was – meaning the search for LGD’s was on. 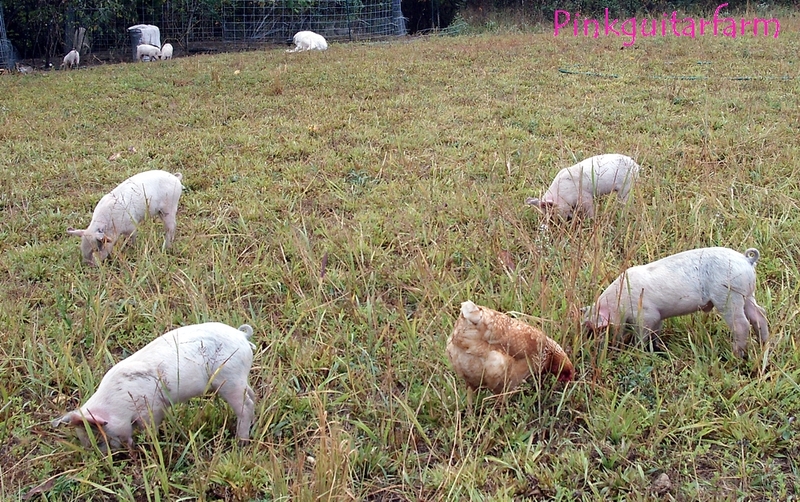 As you can see below, the piglets enjoy a little free ranging too. I started researching LGD’s about six months ago, but with so many projects, I wondered how I would have time to train one… or two. Nevertheless, I had talked to farmers, seen LGD’s in action and felt confident that they would work for us, we just wondered how to find one preferably already trained (training can take up to two years) that would also be able to transition to our farm. 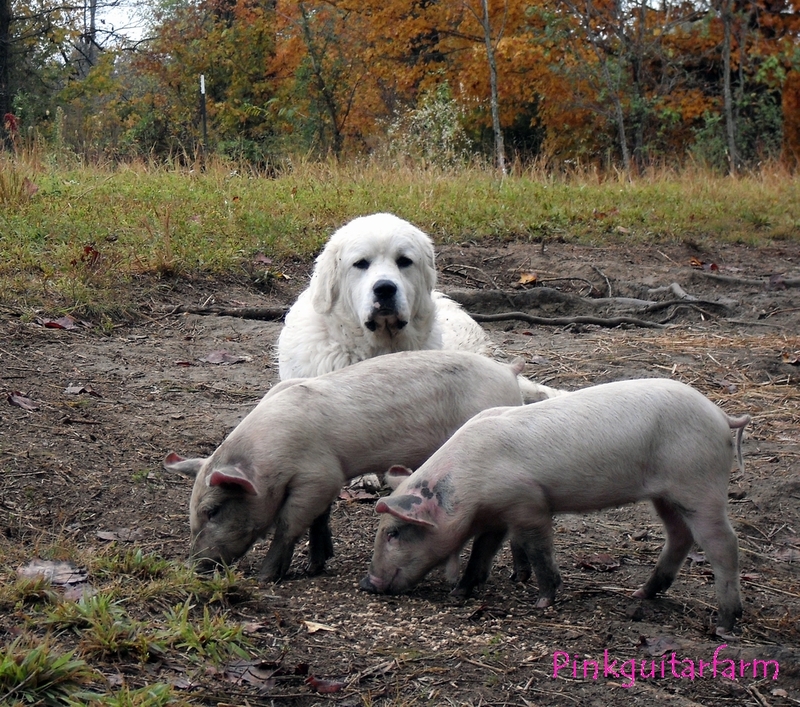 While we were out picking up our RWH gilt, I mentioned to the farmers at Ecotonefarm that we were looking for LGD’s (they have two wonderful Great Pyrenees dogs). And as luck would have it, they knew of a farmer who was looking to place two 18 month old Great Pyrenees dogs, a male and a spayed female who were siblings. After several e-mails, phone calls and a visit to our farm by this very conscientious farmer, we went to pick up Jane and Burley on October 3rd. This is Jane (to the left), not only does she patrol all night long between the chicken coop and the pig pens, she walks the kids to their bus stop (the entrance to our driveway) in the morning. Jane is a sweetheart. 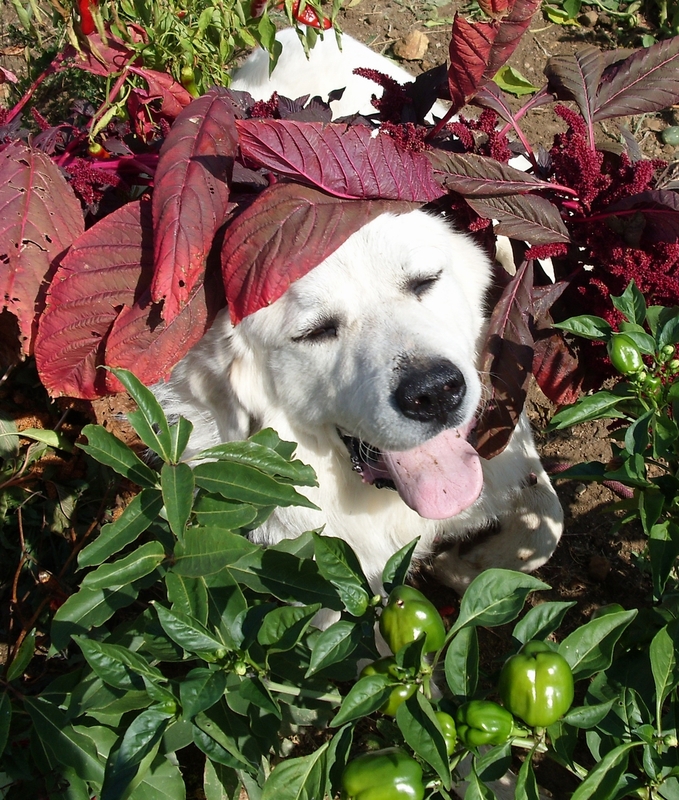 This is Burley (above right); he wanted to hang out with me in the garden today while I harvested sweet potatoes. I put him in the shade by the barn since he is too large and furry for the meager shadows of a fallen amaranth flower stalk and a bell pepper plant. I sure appreciated the company though! He is a big sweet boy. Poor Jane, she had no idea that when she came here, she would have the dubious honor of piglet babysitter. She is a good piglet herder too, especially when they are naughty and try to eat the chicken food up by the barn. Burley is more reserved and mellow than Jane, and he has a very deep bark. There have been no more chicken losses in the past 10 days since they arrived here. 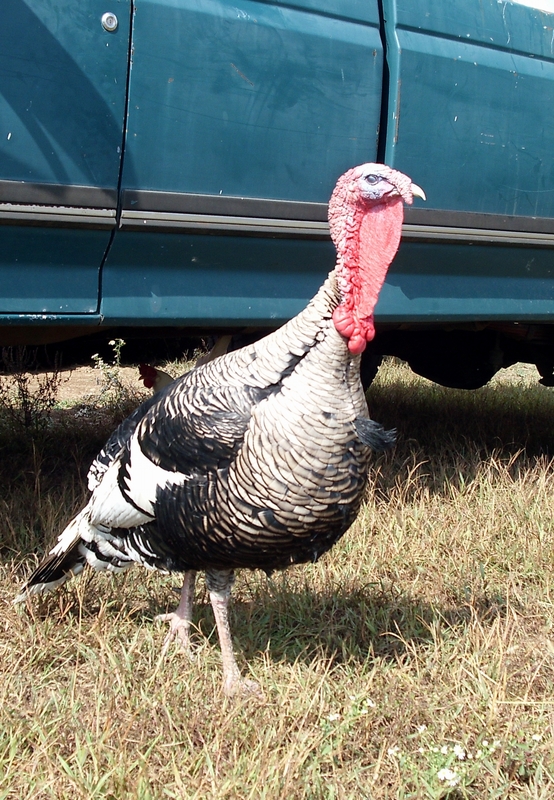 Everyone sleeps better at night now that Jane and Burley are here on the job, including our Narragansett tom turkey, Brad. 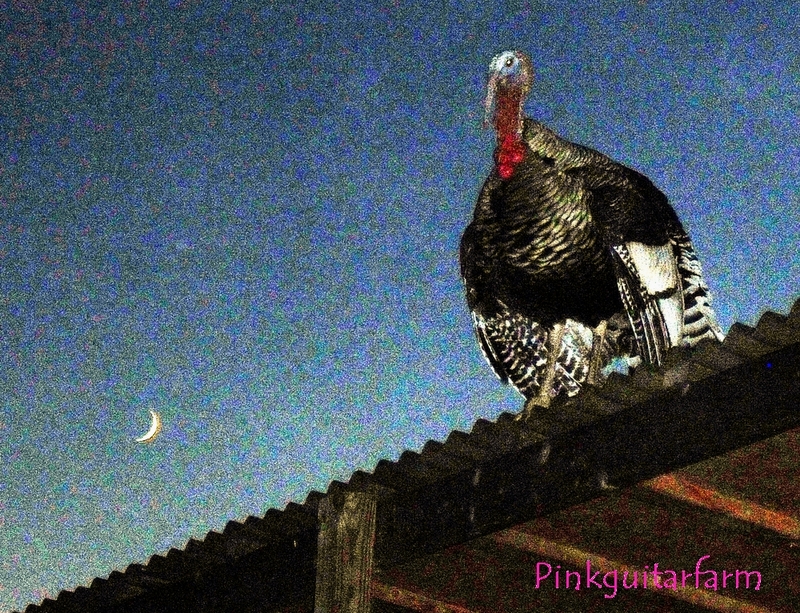 In fact, he feels so secure now, he even gobbles at the moon. G’night Brad! We are very grateful to have found Jane and Burley through the farmers at Ecotonefarm and to benefit from the wonderful training they received from their former owner. 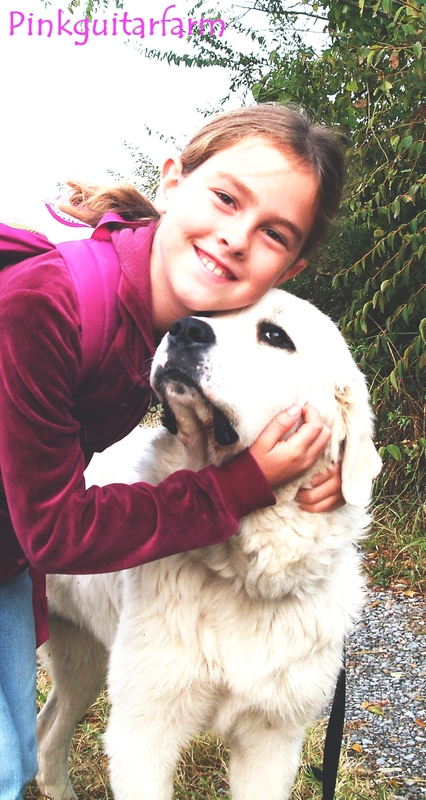 Jane and Burley are truly amazing, incredible dogs and are already a very important part of our farm. Many thanks to C.J. and Fletcher!